Meggan and I got to spend one day in Dhaka before heading to Nepal. There was breakfast at the American club. There was much shopping for family members. There was riding in 3 different CNG's (tuk tuks, which, if you know my love of public transportation, you'll understand why this was a great thing). There was dinner at Soi 71, a Thai restaurant. The next afternoon, we left for Nepal. I can now say, with authority, that the toilets on the Bangladesh United Airways flight were the most disgusting toilets I've ever used. Even more disgusting than the toilets on a Russian train. We arrived in Kathmandu in the early evening, trekked to our 5th floor hotel room, had incredible Tibetan food at Hotel Utse. I bought a new purse (I forgot to pack mine). Our hotel had a cool bathroom sink, which wasn't conducive to washing your face easily. Wednesday, we boarded our bus to Chitwan. I knew it would be crazy, but it was truly insane. We (the white people) were stuck together at the back of the bus, which drove crazily down the valley. Fortunately at lunchtime we switched busses. Meggan and I were the only two passengers going to Chitwan, so we had the bus to ourselves. We took a nap, had dinner, then I went to a cultural show. The next morning, I rode an elephant, it was amazing. Then we took a nap. There is much napping, we were very tired. We ended up taking a bus to Pokhara the morning after. Pokhara was also rainy, but a perfect shopping destination. Meggan took this while we were waiting for the rain to pass. It looks black and white, but it was taken in color. It rained really hard, for a really long time. We flew back to Kathmandu, we'd had enough buses. 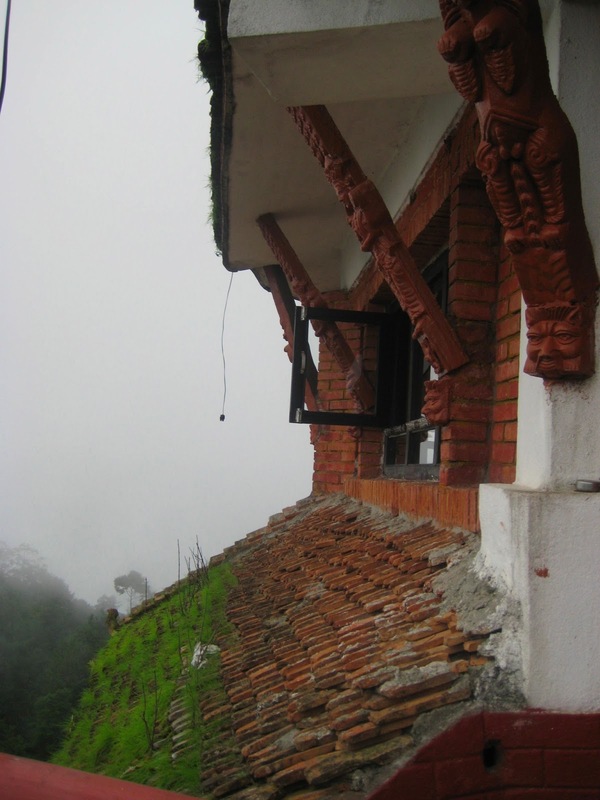 Nagarkot is a small town that has wonderful vies of the Himalayan mountains, even with the clouds. The hotel we stayed at used to be a Hindu temple. Then we flew back to Dhaka. Meggan has now been on two Bangladeshi airlines. I was impressed, they were generally on time. The final day in Dhaka, we went more shopping, tuk tuk riding. I even got Meggan to ride in a rickshaw. We ended it with manis/pedis/facials (yes, that was our second time) and dinner at the Nordic club. Poor Meggan, her flight home left at 5:10 am, so we had to get up at 2 am to get her to the airport. She made it home all right, and even had a 24 hour layover in Toronto to chill out and get over jetlag a little. I had a nice day off before starting on my next adventure, which we'll be called the Super Awesome South East Asia Adventure. More on that to come. Last week, my friend Meggan came to Dhaka to visit. It was amazing to see someone with a familiar face, there was much rejoicing. The same day Meggan came we had the school closing assembly and "graduation" for the 8th graders. Friday, we (myself, Meggan, and 4 other teachers from my school) left for a super awesome Bangladeshi adventure. We started in Srimangal (also spelled Sreemongol, Sreemangal, and Srimongol, I've never seen it spelled the same way twice on any map). Sreemongol is often called "Little Darjeeling" because of it's massive tea gardens. For the first time in Bangladesh, I saw an actual hill (that wasn't man-made). Covered with small, dark-green tea bushes, it was an amazing sight. We went and got some infamous 7-layer-tea (which was very, very sweet). We had delicious naan at an Indian restaurant. We stayed at a true Bangladeshi guest house (which had no internet and generally no electricity). The next morning we trekked through the Jungle. Now, I've worked at a girls camp 5 summers, I don't mind getting dirty generally, but I'm a little too much of a girl to be fully comfortable with spiders the size of my hand and leeches that leave blood blisters. It was a great experience, and now I can say I've trekked through the jungles in Bangladesh. Our guide was very knowledgable, and we were glad we didn't do it on our own (like the guide book suggested), because the trail was hard to follow. We trespassed into a tea/pineapple plantation. Meggan also took this picture. I forgot my camera. We then drove to Syhlet, the largest city in Northeastern Bangladesh. It lies on the border of India (I could, arguably, see India from the hotel we stayed at) and is generally more well-off because of the giant natural gas fields that have been discovered nearby. We stayed at an eco-resort, which had a rickety old train to bring your bags to the top of the hill. It had beautiful views of the sunset from our private verandas. I fell down. Twice. Scraped both knees. It hurt. The next morning we went on a 2 hour boat ride on the Lalakal river. Come to find out we were in India for a good chunk of the ride. It was beautiful and peaceful. My legs (which are bleach white most of the time) actually soaked up some sun! That afternoon, we ate and headed home on the Dhaka Syhlet highway, which is regarded as the most dangerous road in the world (which is why I didn't mention this to my mother until after we were safely home). It was scary and dangerous, we survived. I truly feel like I've seen a side of Bangladesh that I conceptually understood, but it was so nice to actually see it. Beautiful, clean, and friendly (non-staring) people. A great start to our adventure. Well, I've finished the fifth installment in George R.R. Martin's epic fantasy series A Song of Fire and Ice. Or maybe it's A Song of Ice and Fire? I just call it 'big stabby, dragon book' in my head. The story picks up in Westeros, where the fourth book, A Feast for Crows, began. Originally, this book and the previous book were to be one, but they got too long. So we have to backtrack in time some. Jon Snow, the Lord Commander of the Night's Watch is dealing with the end of the battle for the wall, the appearance of Stannis Baratheon, the sinister workings of the Lady Melisandre, and the politics of leading men who don't necessarily trust him. Of all the characters, I never really cared for Jon Snow, but I can't quite explain why. Across the narrow sea we finally get to catch up with Daenerys Targaryen, as she sits the throne as Queen of Meereen. Everything is not as she hoped, it is taking far too long to free the slave cities and she has grown restless waiting to return home to Westeros. We never get quite enough of Daenerys in the first four books, but we seem to make up for it here. Too much. A good chunk of her story is councils and talking with her advisers, and her dragons are locked away in the basement, because they've grown too large and unruly. This is not the dragon queen I wanted. Tyrion Lannister is on the run after he killed his father, with a quarrel to the chest while Tywin sat on the toilet. It was a perfect end for the awful man. Having watched the TV show and read the books, I'm continually amazed at how perfect Peter Dinklage is for the role. Tyrion is my favorite character, but I try to keep a distance. Martin has a history of killing off your favorites. Cersei is in prison. I can't imagine a better place for such a horrible person. I practically cheered when they threw her in the cell. She was crazy with power, thinking herself such a great ruler, but clearly has no acumen for the role. Arya, meanwhile, continues to live in the free cities. I'm interested to see what role she will play. Her story is caught in a holding pattern and she deserves her vengeance against the Lannisters. As with all the books in the series, Martin is unafraid to kill off characters. There are many readers who get annoyed, but I continually feel that he stays true to life. In movies and books, the heroes are always surrounded, but they find a way to get out. In Martin's books, the hero is surrounded and then they die, because you can't fight your way out of some things. It is a bit longer to read than I prefer. Taking additional time to catch us up with the stories of those we didn't get to in the previous book. Also, it was rather annoying to have to backtrack, because it took half the book to get to new action. Overall, I still love these books. I'm somewhat disappointed that I'm finished with the fifth, because they don't expect the sixth to come out until December 2014 (at the earliest, but Martin is always pushing his dates back). At no point would these books be appropriate in a school library. There may be the odd student who is ready for such dark, high fantasy, but even then I would hold off on recommending these. There were a couple of scenes that left me with a bad taste in my mouth, and the general tone of the series constantly seeks to remind you of the stark awfulness of life. The fifth installment in the high fantasy series A Song of Ice and Fire, A Dance with Dragons picks up where the fourth installment began. This time we follow the stories of those we missed in the previous book: Daenerys Targaryan, as she battles against slavery and builds her army. Jon Snow, as he struggles to learn his new role as Lord Commander. Reek (Theon Greyjoy) as he plays a role in giving the Bolton's legitimacy. Tyrion Lannister on the run after murdering his father. There are many other minor characters as well, whose perspectives help clarify the story, although it tends to muddle it a bit as the reader struggles to remember who they are and where they fit in. Martin's massive tome is filled with wry humor, bloody battles, horrifying violence, cliffhangers, politics, intrigue, and he is never afraid to kill off a character. The story does not progress as quickly as many readers would like, especially considering the first half of the book is a rehash of many of the events in the fourth book, although from a different perspective. Definitely only for adults, but not necessarily for fantasy fans, this book will leave you wishing the sixth would get here faster. I've been meaning to post. I always come home at night and think “I should write a blog post,” then I make myself a peanut butter and Nutella sandwich and that’s all she wrote. Apparently Nutella isn’t a word. I argue it’s one of the most important words in the human language, because the consumption of Nutella has saved so many young lives this year. Can you tell it’s the end of the school year? We’re doing an end of year inventory in the library. I have about 4,500 books. I’m also missing about 37 of those books. I get to go through that list tomorrow. We've checked all the students’ rooms, lockers, in the faculty lounge, etc., only found two of them. What is an acceptable amount of books to lose? I imagine 1% would be expected. Don’t stores always assume they’re going to lose some amount of stock to sticky fingers and general inventory being weird-ness (that was an awkward sentence)? I expect the missing books are files for books we never received, because they (Follett), sent us files for everything and some of the order wasn't available. The joys of having a new library I guess. I've been playing around with the thought of doing an end of year report, but then I'm tired and teaching 3 classes, and writing 3 exams, and, yeah. I’m also doing a personal end of year inventory. I’m going to a clothing/household items swap on Friday. For people leaving and not wanting to take crap back with them. So I went through my closet. How is it that I brought so few clothes and still didn't wear all of them. Over the summer our rooms are not going to be air conditioned, which means I'll probably have mold on my clothes if I leave them out, which means I'm packing things that will mold into my suitcases. Holy crap how much I hate packing stuff. I requested that my room be painted over the summer. It's a pukey creamy light green-ish color (think cream, but with green undertones instead of warm undertones). We'll see what happens. I've asked for many things in relation to my apartment and get about a third of them (I'd also really like more than 3 cupboards in the whole place). So, I set goals. Read a book a week and review it. I did read a book a week, but didn't necessarily write a review. I've been focusing more on non-fiction books and the last couple I've read have been awful. Boring, picture-less, oddly worded. I read one today about signs and symbols in religions and it wasn't really about religions, so much as it was about signs and symbols. And it wasn't so much about religions as it was about Christianity, Islam, and Judaism. Sure, there are billions of those, but there are also billions of Hindus, which is full of symbolism. How can you have a book about symbols and skip over the amount of symbols in the Hindu religion. Or not even mention that the six-pointed star originated and is still used in the Hindu religion (it's the symbol for education, so it's usually on schools), but mention it is called the Star of David. To me, that interconnection between the two vastly different religions is fascinating and having a book about symbols not mention it is ridiculous. I've pretty much planned my whole summer, up until the end of July. It's practically a circle, beginning and ending with Bangkok, and a side trip to Hong Kong. 9 weeks. 5 countries. Some would call it exhausting, but I've built in lots of down time. I plan to read all the Jack Reacher books, for no reason other than they sound like fun. Big dumb fun, beaches, movies, museums, trains. These are all my idea of fun. 9 days, I can do this.